Amid a national emergency, it's disappointing that none of Ireland's left-wing politicians are at the heart of direct action for better housing, writes Donal MacNamee. On November 1st, 2014, more than 120,000 people hit the nation’s streets in protest against the imposition by the government of water charges. Whatever your perspective, it was an irrefutable demonstration of the potency of mass action, and it worked. Four years later, water charges have quietly disappeared from the agenda, reinforcing the self-evident truth that enough boots on the ground will always force policymakers to listen up. Sift through newspaper coverage of the protests and the same names continually crop up. Solidarity TDs Ruth Coppinger and Paul Murphy are the two who most often feature, with Richard Boyd Barrett also appearing regularly. What the three all have in common, of course, is that they’re all left-wing TDs, elected to do exactly as they did during the water protests: marshal and lead mass campaigns, and harness the will of the people to force the government’s hand. To be clear, all three are to be commended for their role in the water protests, Murphy perhaps most of all. Regardless, again, of your political leanings, it’s inarguable that Murphy played a key role in bringing the campaign against water charges to a national platform. He used his status as a high-profile politician to elevate the gravitas of the protests, and it’s nigh on impossible to argue that he was not at the vanguard of a movement that successfully forced water charges off the table. Murphy, Coppinger and Boyd Barrett all still hold seats in the Dáil. They make up half of the six hard-left TDs in Leinster House – an unusually high number among an electorate traditionally sceptical of the Irish left. Their mandate has not changed. They have their seats because they have convinced voters that they will fight for them from a left-wing perspective, against cuts, and for social and economic change. It’s beyond baffling, then, that none of them have used their profile or influence to lead, in any substantive way, a movement around the current housing crisis. People Before Profit, admittedly, was the party behind the cross-party motion on housing that forced the government to declare a national housing emergency in October, but in terms of tangible contributions to the direct actions of the country’s housing activists, it’s difficult to discern much from the country’s left-wing politicians. And if the housing crisis is indeed an emergency – and there is little reason to suggest it isn’t – then it’s eminently valid to expect politicians to be doing literally everything in their power to help change things. If direction is what the housing movement so desperately needs, and from those with experience of providing it, then nowhere was this lack of order more clear than at this month’s Raise the Roof rally. Looked at one way, the rally – which mobilised thousands on a Wednesday afternoon – was an impressive show of strength from a movement that is increasingly forcing the government to pay attention, the culmination of months of work from grassroots activists. From another perspective, though, it was poorly organised and in many ways underwhelming. One speaker, for instance, veered wildly into left field when when he called Jack O’Connor, the General President of the Services Industrial Professional and Technical Union (SIPTU), a “disgrace to the people”. The rally’s organisers inexplicably declined to fill up the length of Molesworth St, allowing instead many thousands of protestors to remain round the corner on Frederick St where they could neither see nor hear what was going on, and where they could not add to the visual strength of the rally. And Senator Frances Black, to top it off, made the strange decision to express herself through song, leaving the crowd baffled and summing up an event that smacked, in the end, of a lack of detailed planning. Even if you argue that the overall limpness of the speeches was ultimately of less import than the show of numerical strength from activists all over the country, it’s surely at least odd that none of the country’s politicians spoke. Boyd Barrett, perhaps the country’s foremost socialist politician, quietly watched proceedings from the steps of Buswells Hotel, barely 10 yards away to the right of the stage. It was symbolic, in a way. Boyd Barrett appears, at times, to have played the role of a spectator over the course of a housing movement that has expanded in stature and power thanks far more to the efforts of grassroots activists – many of whom are students and none of whom, certainly, are paid close to €100,000 a year – than to him or any of the country’s other politicians. If Murphy or Coppinger have contributed in any meaningful way, they’ve hidden it well, and Bríd Smyth, Gino Kenny and Mick Barry have managed to remain largely anonymous throughout, even as activists from Take Back the City have suffered beatings, handcuffings and arrests. The housing campaign has grown outwards from a summer of direct action from local activist groups. After consistent, visible and often intelligently planned action, Take Back the City has grown into a national campaign with a stature not seen on an economic issue since the advent of the water charges. Its members deserve great credit for pushing the matter into the political mainstream, for shunting Fianna Fáil to the left and for putting the government in what is now a tricky situation. But undermining all of this is the feeling that if Ireland’s left-wing politicians would just do the job for which they were elected, then this campaign could be far bigger – and, just as significantly, better organised. Campaigns like this one should be the bread and butter of these politicians. They have been here before and they have won on these battlegrounds before, and it is very difficult to explain why that is simply not happening this time around. As a famous Irish politician, Coppinger should be at the forefront of everything to do with the crisis. Murphy should be leading the conversation each and every day. Boyd Barrett should at least be addressing the thousands of activists who attended the Raise the Roof rally. 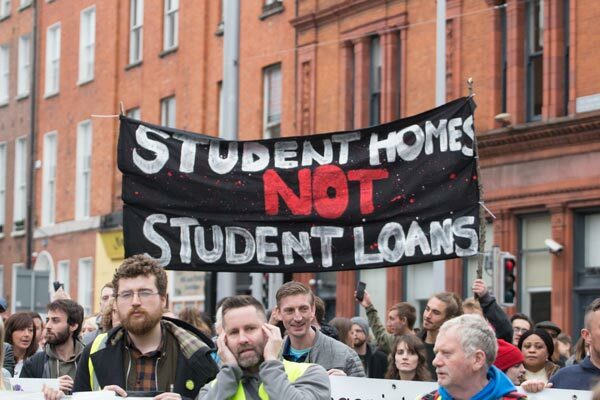 If the housing movement has any chance of growing to the level of the water protests, then the efforts of dedicated housing activists must be matched with an equal display of commitment and zeal from Ireland’s left-wing politicians.